Y. Zhuang, UF/IFAS Extension, Marion County, Ocala, FL and J. LeCroy, UF/IFAS Extension, Marion County, Ocala, FL. Situation: Nearly 1000 people move to Florida every day. Most of the migrations come from the Northeast and Midwest. A large portion of them are unaware of the different climate and hydrogeology features of Central Florida and they are using out of state practices (e.g., irrigation and fertilization scheduling) in their homes and landscapes. These practices contribute to nitrogen loadings in springs and streams. Objective: A series workshop, Florida-Friendly Homeowner, has been developed and framed for homeowners who are new to Central Florida or unfamiliar with Central Florida’s unique features to increase their knowledge about water and energy conservation as well as Florida-Friendly LandscapingTM. 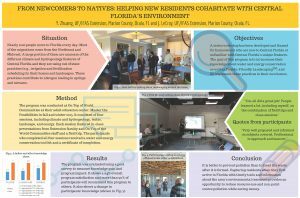 Methods: The program was conducted at On Top of World Communities in fall and winter 2015. It consisted of four sessions, including climate and hydrogeology, water, landscape, and energy. Each session featured in-class presentations and a field trip. The participants who completed all four sessions received a water and energy conservation tool kit and a certificate of completion. Results: The program was evaluated using a post-test survey to measure knowledge gain and program impact. It shows a 94% overall program satisfaction and more than 90% of them will recommend this program to others. It also shows a change in participants’ knowledge. Based on self-assessment with a scale from 1 (i.e. no knowledge of the topic) to 5 (i.e. know the topic very well), participants’ average knowledge level related to water increased from 1.9 to 4.0, landscape increased from 2.1 to 3.9, and energy increased from 2.7 to 4.0. Conclusion: It is better to prevent pollution than to treat the waste after it is formed. Capturing residents when they first arrive in Florida with timely tools and information about the area’s environmental resources provides an opportunity to reduce resource use and non-point source pollution while saving money.